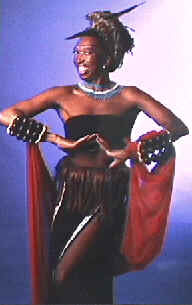 The Miss Thandi Show was the musical cabaret-show by Raymond Matinyana. The show was full of South African energy with a strong interaction with the audience. Miss Thandi performed with the Afro Vibes Band and turned every party or meeting into a unforgettable feast. From the country of Clicksongs. but at the same time elusive and mysterious. Feel the pulse of African rhythms. Learn African dances, and sing along. the entertainer from the country of ancient cultures and very new future.